With the exorbitant use of cell phones in this day and age, everyone has their cell phone in their car. While you should never text and drive using the phone for navigation still seems to be legal. Most cars nowadays have built in GPS, however Google Maps and Waze have waaaay better navigational skills so I find that most people use their cell phones. Having a great cell phone mount is crucial to have a clear view of your cell phone screen while driving. 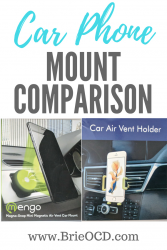 I have been using the Mengo magnetic car phone mount for years (and LOVED it) but recently with the purchase of a new car it was no longer doing its job. My old car had a ledge under the air vent so it cradled my phone, the new car does not. That wouldn’t be such a big deal for most but I have a cell phone case with credit cards in the back so the magnet has trouble getting through the case and cards and keeps falling off while I drive. I began the hunt on Amazon for a new and improved air vent car phone mount that could handle the job! I came across the Beam Electronics Car Air Vent Holder and I have to say I am impressed! It was easy to set up, is sturdy, fits any size phone, rotates… the list goes on and on! I do still love the Mengo car phone mount but it does have a couple shortfalls that the Beam electronics phone mount does not. 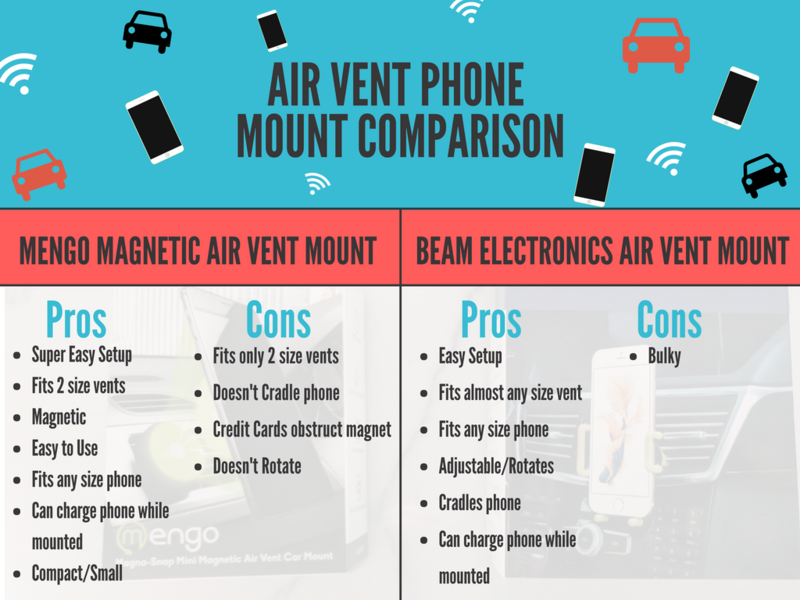 Check out the diagram below and watch my YouTube video below (or by clicking here) to see the product unveiling and in person review of each car air vent phone mount. Different people have different needs. Between the two of these phone mounts you should have everything you have ever desired in a car phone mount. They both are around $8.99 are easy to set up and fit any phone size. They both are air vent phone mounts so if you are looking for a dashboard mount, you will have to look elsewhere. I didn’t even consider that route because they are so bulky and obstruct your view. Click on the affiliate links below to view/buy! Just scoped em out! They look nice and heavy duty!! A wee bit expensive for me personally but love the hot tip! Love me some Australian goods! Thanks for sharing! It’s really a nice product report.